The pilot episode of the series „… a je to!“ (means „… and it is done”) was made in 1976. Lubomír Beneš, the artist and the director was insired by his own comics stripes in the newspaper. They were about two handymen Mr. Ouholíček and Mr. Sedlec. He asked the script editor Mr. Jiří Kubíček and other artist and film director Mr. Vladimír Jiránek to join him and together they created the first episode called „The Handymen“. 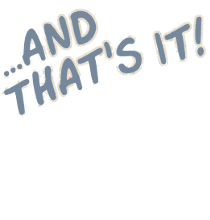 Since 1979 the creators of the series shot the series now called “…. A je to!” in the Krátký film studios Prague for the Slovak televison in Bratislava. In the series they changed their dresses and got the hats too. After a short break in 1985 the shooting of the series continues, but no longer for the Slovak Television, but for the Kratky film itself. Also at that time the two guys got their names Pat and Mat. While Lubomír Beneš was on the look for the names he let himself to be inspired by the children’s wishes. He was having his programme called “Magic World of Pictures and the Alphabet of the Animation” where he discussed with the kids about the possible names. Next episodes were made in different studios (AIF, Ateliery Bonton Zlin, Patmat, Anima). Currently, there are 103 episodes. 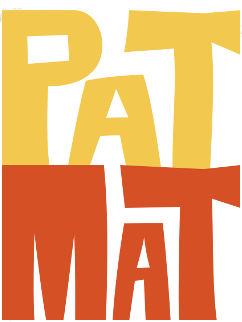 The last 13 episodes of the series "Pat and Mat have fun" were produced by studio Patmat film, Ltd. The films directed by Marek Beneš, the son of Lubomír Beneš. The series is successful in the whole world. 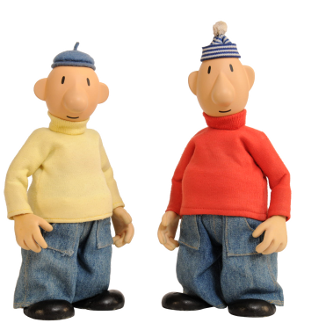 In the Poland they are called “Neighbours” in the Netherlands they are called Buurman en Buurman (Neighbour and Neighbour) in some Middle East countries they are called Zingo and Ringo. One country only gave them the voices. In the Netehrlands they speak with the voices of famous Dutch actors and comics Mr. Kees Prins and Mr. Simon van Leeuwen. The Dutch dubbing is a free improvisation of those two actors. Recently we we attended the film festival in Iran and the popularity of Pat and Mat there was a real surprise. In the Czech republic there is a CD narrated by Mr. Pavel Zedníček and also the books with the stories based on the TV series.